I believe Saya Gyi Hte Bu Phe will be in the good place because of his dedication to his people. I also hope someone will take over his unfinish work and continue to write Karanni dictionary. 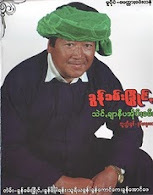 I believe Saya Gyi Hte Buu Phe will be in a good place for his dedicated work on his people. I hope someone will take over his un-finish work and continue the Karanni dictionary.